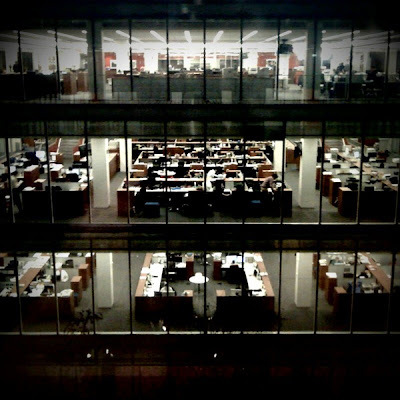 the nytpicker: A Nearly Empty NYT Newsroom, As Photographed By Reporter Brian Stelter On December 17, 2009. Really, 9pm? Looks earlier to me. Brian probably took the pic for a reason. Not a happy day but one to remember. The newsroom does stretch away from those windows by another 3 lengths from what is visible there, so that's not really a good measure of how empty it is. And 4th floor is mostly culture so they wouldn't necessarily need to be staying so late. And sports reporters' desks are usually pretty empty. The last two rounds of layoffs got rid of maybe 20% of the employees. So preterite 80% should still be sitting around, clinging to their desks, and trying to look busy. So I vote for this picture being taken at a time when no one is usually around the newsroom. Lured into meetings with the industry's equivalent of lobbyists, aka business reps tempting them with gadgets, trinkets, signing bonus', baskets, tickets, seats, trips, membership, oral time, talking points, passes, openings, parties, starlets, pasties, steak, chips, gum, glitter, prizes, razzle, dazzle, fizzy brew, samples, complements, promises, consultancy, and whatever else it takes to phase them as pudding, putty, and jolly agreeable hamsters into a harmonious voyage by train. I guess they were all out watching that dude Rachel Maddow. He says some really crazy stuff! Na, that dude don't do drag so well, no heels, no wig. Betchya they was watchin plenty of them real sick puppy politicians get it on for the good men and women of them country the nebraska way, pitching the family with them little corns here and there.